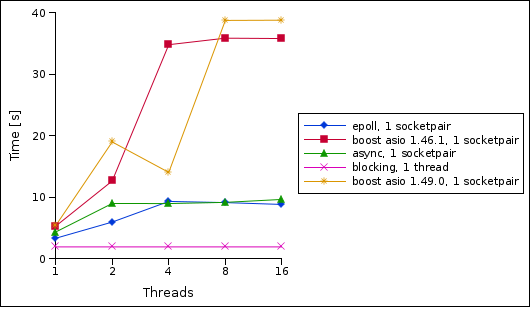 What's interesting to see is that there are 3 threads involved with significant locking (via futex) between those threads. That's definitely what you would expect. BTW, I did apply a crude fix for the spurious EPOLLOUT events to boost asio to not get distracted from those. 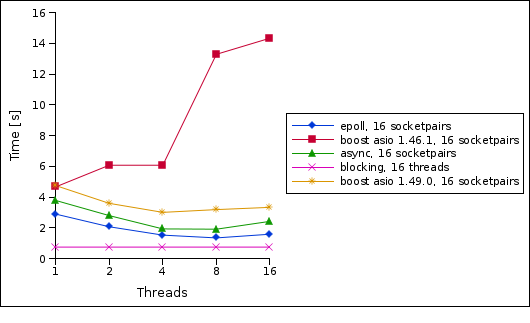 One thing I noticed when looking at epoll scalability was that Linux seems to generate lots of spurious EPOLLOUT events (even when using EPOLLET - edge-triggered). To illustrate the issue, have a look at eptest-out.cc. This clearly shows that Linux generates an EPOLLOUT event for each send syscall even though there is no need as the state hasn't changed. Just couldn't stop running this morning and ended up doing 7 laps around Battersea Park - Google Maps reckons it's about 3.3 km per lap - which would mean around 23 km in total.